I hope you all had a nice weekend, and looking forward to the shortened week this week. Rumours have it that many in Government sectors (not an official thing mind you) are only working a 2 day week this week. Must be nice. 1. You have until June 1st to get a NOC from your current employer (if you are changing jobs) - On June 1st, your visa won't be transferable with a NOC. Which means not a lot for you, but for employers it means that your visa is then cancelled, and another one in it's place (to replace you from the job you are leaving) will not be easily obtained. 2. You have until July 1st to get your new Visa issued in your passport. Unless you are renewing your visa in your current job. So, if you left Oman on September 15th, 2012, and wanted to come back to work in Oman, you would not be able to get your visa until September 15th, 2014 - 2 years later. If you are already here and are changing jobs without a NOC (still possible until July 1st) you better get moving. 3. From June 1st, any employer issuing a NOC to an employee wishing to change jobs, will do so at their own peril - it's not automatic that a new clearance would be issued. Which means, that it is all very well and good to say that employees in good standing can change their jobs (whether they have worked their Contracts to completion or have a NOC) except that no employer in their right mind will issue a NOC because this will then directly impact them on how they conduct their business. it's always been the case that an employer who issued an NOC could not then ask for a clearance to replace the departing employee. That's why many employers preferred resigning employees to exit the country (if you leave with the correct paperwork and your visa is cancelled upon departure, your former employer CAN ask for a replacement clearance). If an employer will issue an NOC: yes, right now it seems that NOCs will be accepted up to 1st June, to transfer from one employer to another. After 1st June, apparently not. And come 1st July, the wait-two-years-before-returning rule will apply. 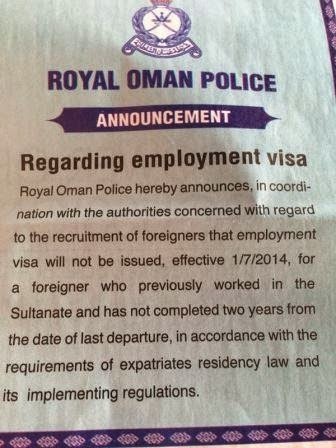 If you want to switch jobs in Oman, if you can get an NOC this week, great. If you can't, the only option is to exit with a proper cancellation, and pray your new employer can get a visa before 1st July. After that? Better stay put! Or try some other country, which would be a pity since this, after all, a great place to be. Good luck to all! Myself included. If the employee finish his 2 years old contract, and wants to change his job, is it possible to change it without NOC? Will it be possible to go out of the country for a short period until his new visa is ready? this contradicts what was written in HI magazine. In HI it explains along the lines of 'if you have completed your 2 year contract in your last job you can change jobs'. Still not clear on this. After i read Hi! i told people i was wrong. As I understand and which is the opinion of many, you may change a job with an NOC at anytime whether you have completed your initial 2-year contract or not whether you cancel and exit the country or not. Although there are many questions, the one that bothers me is of promotions. A company terminates and employee (or he willfully resigns) and they work out an agreement to grant, the now ex-employee, an NOC. Will his subordinate never be able to fill his position? Can he never be promoted to his designation? Legally at least. So people might be misrepresenting the designation on their resident cards just to circumvent the rule. Which reminds me of an anecdote. A lion is brought to the country and the whole staff at the zoo is pretty excited. The first day the lion is served a fresh bunch of bananas. He looks perplexed at first but his hunger gets the better of him and he starts munching on them. The next day at lunchtime the same routine is repeated. Bananas. He gets a bit annoyed but nonetheless eats them as he has no other choice. When on the third day he sees the same menu being repeated, he gets all worked up and grabs the zookeeper, threatening to devour him unless he explains why the king of the jungle is being served bananas. The zookeeper, with his last gasp of breath, says, you may definitely be a lion but your resident card shows you're here on a monkey's visa. I hope it all works out in the end. Let's get this straight - If I buy four chickens at OMR1.5 each, and sell them at OMR1.7, I can expect a profit of OMR500 unless I tie one of each chickens'legs to the other chickens, in which case I will receive OMR250 because using the Ministry of Chicken Farming's logic, a chicken with only one leg is worth half as much as a chicken with two. In the case of a chicken with only one eye, what is the procedure then? I assume I apply to the Ministry of Chicken Farming to adjudicate on a case by case basis, with only those poultry farmers supplying the correct amount of wasta receiving favourable outcomes (OMR 600 per chicken). What about if my flying horse has only one wing? According to a clarification made by the ministry/minister in an Arabic newspaper, the two-year ban is ONLY enforced if you have not completed your employment period. You can switch jobs anytime with or without NOC as long as you've completed your contract or your employer has no objection of letting you change jobs before the contract is up. There are so many versions of this law, and everyone interprets it in a different way...even the police. It's frustrating. A PRO told me that after 2 completing the 2 year contract you are free to change. Seems noone knows for sure still.